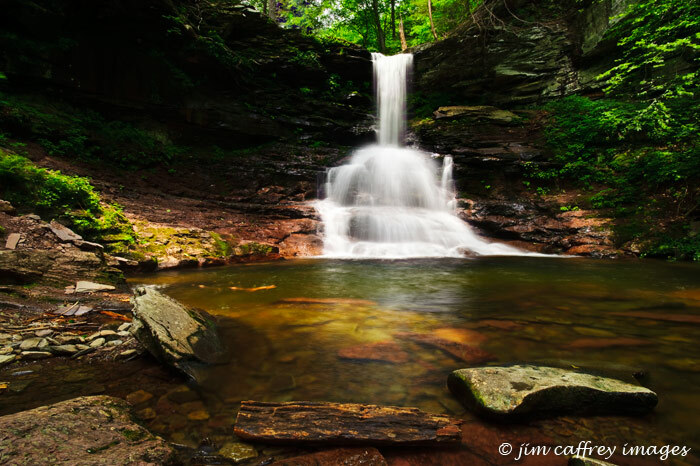 This is Part 2 of a two part post on Ricketts Glen. 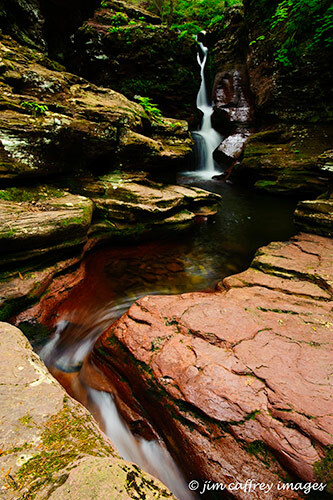 See A Stroll Through Ricketts Glen (Part 1). After spending some time at Waters Meet, we crossed the bridge and began the climb up through Glen Leigh. This leg of the hike was a true test of my stamina–a seven hundred foot elevation gain in a little over a mile. The beauty of the place fortified me though and we had barely gotten started when we came upon Wyandot Falls. And a little farther on we discovered this beautiful unnamed cascade which I dubbed Tranquility Falls. I had the sense that Glen Leigh was much narrower and steeper than Ganoga Glen, but after studying a topo map of the area I discovered that they are both about the same near the bottom, but Ganoga does flatten out a little near the top. As we continued up the deep green canyon, we passed B. Reynolds and R.B. 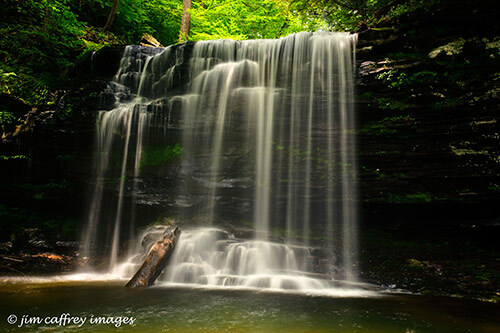 Ricketts Falls, and then came to Ozone Falls which, at sixty feet, is the highest waterfall in Glen Leigh. It cuts a graceful curve as it descends over the many layers which define its classic form. After passing Ozone Falls the trail became noticeably steeper and narrower for a short distance. We stopped at Huron and Shawnee Falls and then continued up through the seemingly endless world of green and rushing water. When we finally made F.L. Ricketts Falls I was looking forward to the end of the trek. I set up a shot and then stepped back to look at my framing options when I saw movement out of the corner of my eye. I turned to see my camera on the tripod fall over and land lens down on the rock. I frantically picked it up to survey the damage. My heart sank when I saw that the Neutral Density filter was shattered. I tried to unscrew the filter to determine if my lens was damaged, but it was stuck, the outer edge of the filter was bent from the impact. I finally managed to loosen the filter and was relieved to see that the lens was undamaged other than some minor scuffs on the filter threads. I replaced the ND filter and made the above image of the falls. Then I packed up my gear and we headed up the trail to the last waterfall in Glen Leigh, Onondaga Falls. Onondaga resembles Sheldon Reynolds Falls in its shape and the way the plunge pool is formed. As I made this final image, I remember being exhilarated by the experience and although we were both physically drained, we made our way back to the car with a smiles on our faces, talking about the day’s adventure. I used to go to Ricketts Glen regularly when I lived in northeastern Pennsylvania. That was thirty-five years ago. I hadn’t been there since, until I made a recent trip back east with my oldest daughter, Lauren, to visit family. We set one day aside to hike and photograph the waterfalls in the park. Actually, there are two glens which make up the Glens Natural Area. They contain most of the twenty-two named waterfalls, numerous smaller unnamed falls and cascades for which the park is famous. Adams Falls, the first waterfall we visited, is a big attraction even though it is quite a distance downstream from the main section of the park. When we pulled into the small parking area at 7:30 in the morning, there were already several cars parked there, all from out of state. A short walk on a well–maintained trail brought us to the falls. As soon as I saw them, I knew it was going to be a good day. We spent about forty-five minutes at Adams scrambling around and taking photographs before we packed up and headed north into the Glens Area. We began our seven mile “stroll” from the small parking area at the top of Ganoga Glen at about 8:30. The trail quickly descends into a world of dense green, and roaring water, but as we became accustomed to the sound, it quickly diminished to a pleasant sibilant whisper. After passing several small falls that are no more than 15–20 feet high, we sensed a sudden change in the timbre of the sound. We were approaching Ganoga Falls; at ninety-seven feet, it is the highest of the numerous waterfalls in the park. Ganoga Falls is a classic “wedding cake ” waterfall. The stream drops and flows over the ledges and crevasses that form the increasingly wider layers of the “cake”. From the edge of the pool at the bottom of the falls, I made what I consider to be my best image of the day. Not far downstream from Ganoga Falls, a small flow enters the main stream from the west. I followed it upstream a short distance to find this beautiful little cascade murmuring its way through a fern covered glade. The scene reminded me of an animated movie I watched with my daughters when they were young. Hence the name: “Ferngully”. We continued down Ganoga Glen past several more waterfalls with names like Mohican and Tuscarora, and on to Sheldon Reynolds Falls, which was as far downstream as we would go. 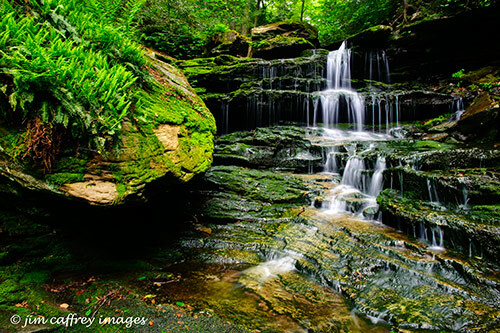 Sheldon Reynolds certainly isn’t as grand as Ganoga Falls, nor did it have the intimate, verdant feel of the small Ferngully cascade. It stands out, nonetheless, with its deep inviting pool and its singular profile. We lingered for a while, enjoying the solitude and the scenery before heading back upstream to Waters Meet. It is here that the streams that course through Ganoga Glen and Glen Leigh come together. 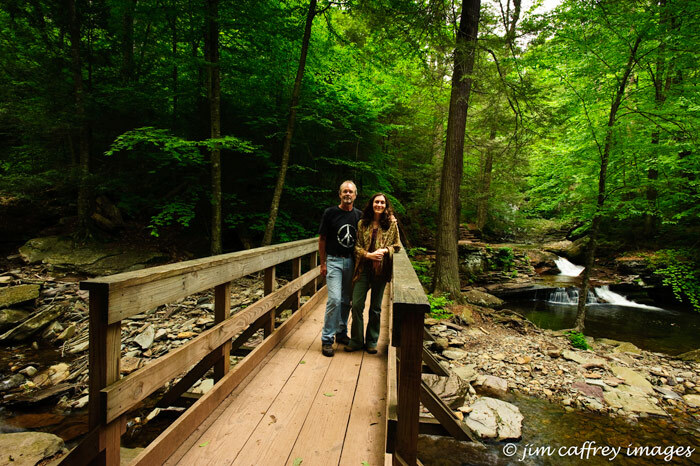 I set my camera on the timer function and took this photo of Lauren and me on the bridge at the confluence. We then enjoyed a picnic of fruit and trail-mix before beginning the climb up through Glen Leigh. 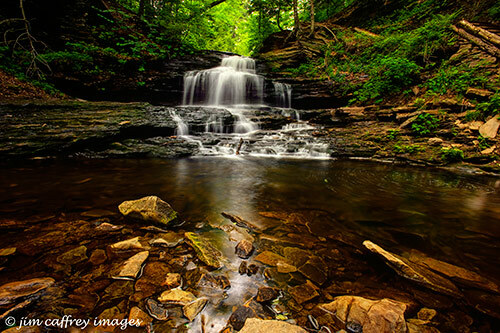 Here is yet another image from Ricketts Glen. Murray Reynolds Falls is the last waterfall going downstream on Kitchen Creek in the main part of the park. Adams Falls is a couple of miles downstream on the other side of Hwy 118, but is usually accessed from a parking area just off the highway. 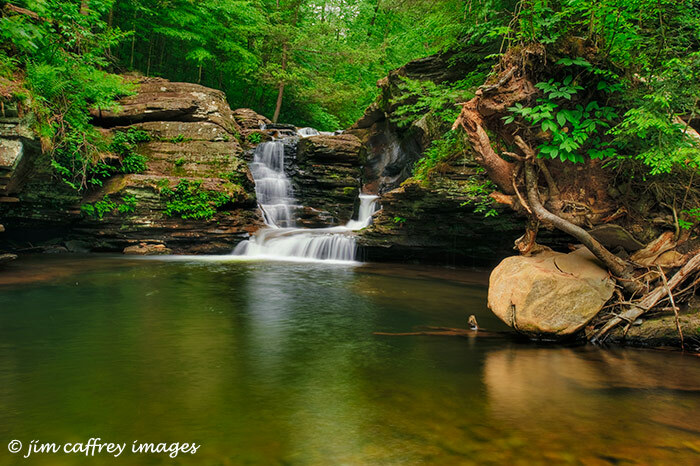 I would say this is the most idyllic of the waterfalls in Ricketts Glen. The emerald pool and the trees which surround it create a sense of calm contentment. Despite the idyllic feel of Murray Reynolds, it was one of the more challenging places to make an acceptable image. The light breezes had begun to kick up by the time we reached here, and the many overhanging leaves were constantly in motion. Normally this would not be a huge problem, but when you use a slow shutter speed to convey the motion of the falls, you also get the motion of the leaves. I have a few other images of these falls that I think are better than this, but this is the only one in which the leaves are not motion-blurred. 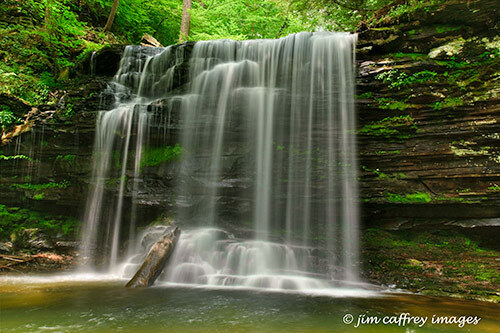 F L Ricketts Falls is the last waterfall I photographed in Ricketts Glen. As I was setting up this shot, I brushed my camera which was mounted on the tripod. The whole thing fell forward and landed lens down on a rock. I held my breath as I inspected the damage. Luckily, the only thing broken was the 3 stop ND filter which had shattered on impact. Silently cursing my inattention while reminding myself to be more careful in the future, I screwed on my 2 stop ND filter and adjusted the exposure settings. Although this is not the best image of the day, it is probably the most memorable due to the near tragedy of a broken favorite lens. I used my usual camera/lens configuration (Nikon D700/Nikkor 17-35 mm f 2.8 wide angle zoom lens) mounted on a Bogen tripod with a 2 stop neutral density filter. I bracketed five exposures which I edited in Adobe Lightroom. I then combined them using Photomatix Pro’s Exposure Fusion mode, and did the final adjustments in Photoshop. 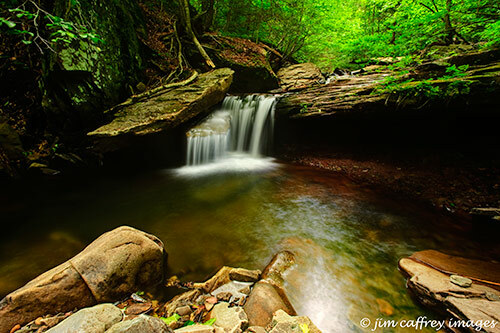 Here is another image that, for some reason, I overlooked on the first edit of my Ricketts Glen photos. I always make it a habit to go back after a month or so and take another look at files I have archived. In this case, I found four images that should have been picks the first time around, but had gotten lost in the shuffle. This small waterfall is in Glen Leigh. It probably has a name, but I neglected to note it if it does. I named it Tranquility Falls for what I think are obvious reasons. The falls themselves have a very calm and peaceful look, and the plunge pool is so inviting. I couldn’t imagine a more perfect spot to sit and meditate on the beauty of the natural world. Equipment: Nikon D700, nikon 17-35 mm f2.8 zoom lens, 3 stop neutral density filter, Bogen tripod. 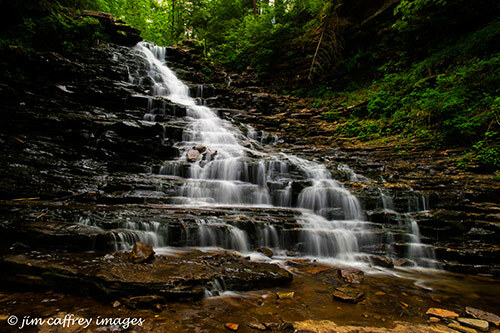 This is an image of Harrison Wright Falls in Ricketts Glen State Park. Wright was a friend of R. B. Ricketts for whom the park is named. 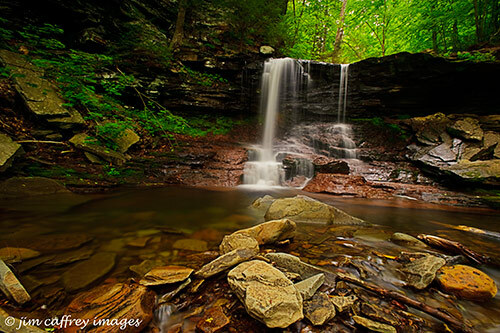 It, along with Adams Falls, is considered to be the most photogenic of all the waterfalls in Ricketts Glen. 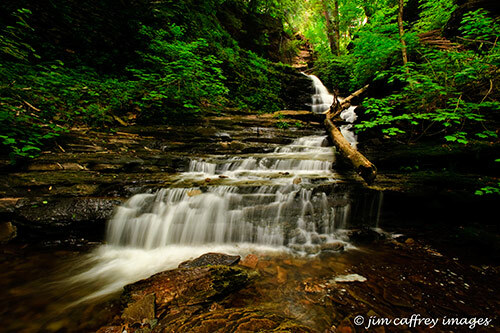 Photographing the waterfalls in Ricketts Glen can be a challenge: the canopy of old growth hardwood trees can be as thick as a jungle in places, but elsewhere, the cover opens up allowing the sunlight to penetrate and illuminate the scene. Such is the case at Harrison Wright Falls, and as any photographer knows, this combination of highlights and shadows can make it difficult to make a good exposure. While photographing this scene, I used a 3 stop neutral density filter to darken things enough to allow me to use a slow shutter speed. This renders the moving water as a silky blur, and in this case causes the falls to look almost like a sheer curtain. All of these measures achieved my goal of capturing the waterfall in an aesthetically pleasing way, but the shadows were almost totally blocked up, and there were several hot spots on the falls. Here is the image as initially processed in Lightroom and Photoshop. I decided that this image would be a good candidate for an HDR image (I had bracketed at least three exposures for each photo I took on this trip). I used Photomatix Pro, and tone mapped one using the details enhancer feature, and made another using the exposure fusion tool. I still could not get what I was looking for, so, starting with the original image, I created a second layer in Photoshop, and copied the exposure fusion HDR image to it, and then I adjusted the opacity of the new layer until I found what I was looking for. The result is the first image seen above. There are many photographers out there who say that this kind of manipulation is not real photography, that it does not render an image that is true to the scene that the eye beheld. But, the eye has the ability to see detail in highlights and shadows, a dynamic range, that is far greater than the that of a camera. So, is this kind of processing really cheating, or is it just another tool in the photographer’s arsenal that will enable him to more effectively capture the scene before him, and share his vision with the world? Equipment: Nikon D700, Nikon 17-35 mm f2.8 zoom lens, 3 stop ND filter, Bogen tripod. 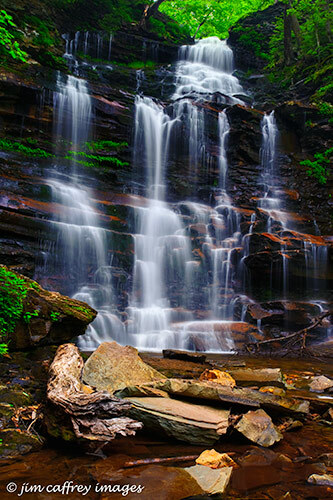 At ninety seven feet, Ganoga Falls is the tallest waterfall in Ricketts Glen. It is a classic example of a “wedding cake” waterfall, so named because of the tiered structure. Wedding cake falls typically consist of numerous small cascades that spread the flow giving the water a diaphanous glow. Once again, due to the high dynamic range of the scene, I blended four source images into this final image using the exposure fusion workflow in Photomatix Pro. I then made the usual curves adjustments in Photoshop. Equipment: Nikon D700, Nikon 17-35 mm f 2.8 zoom lens, 2 stop neutral density filter, Bogen tripod. Camera Settings: f22, 1/2, 1, 2, and 4 sec., ISO 250.